Heavily inspired by DragonDePlatino's tileset for rogue likes (thread http://forums.tigsource.com/index.php?topic=38615.0) I started developing this little game named Dawn. The tileset palette is DawnBringer's. It isn't the first time I attempted such a game type, albeit I haven't finished one of them either. I'm trying to do it right this time; with the awesome pixel graphics motivating quite good. Having some prebuilt map parts interspersed with randomized parts. Plus the fighting system should have a few elements from Final Fantasy (the element/status parts). Currently implemented is a randomization for village, caves and woods areas. Working is a turn/movement system, fighting system and a small menu system. 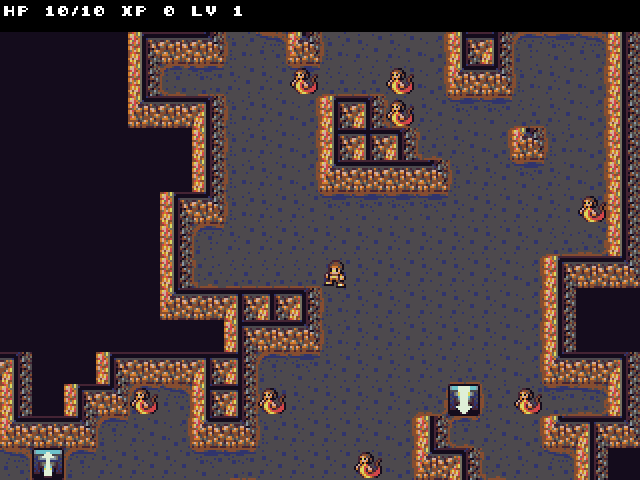 Enemies have levels which are adjusted to the players current level to keep the challenge going. Added projectile and animation series logic. The animation series logic plays animations after each other, making the projectile shot a sequence of advancing the projectile, hurting an enemy, etc. 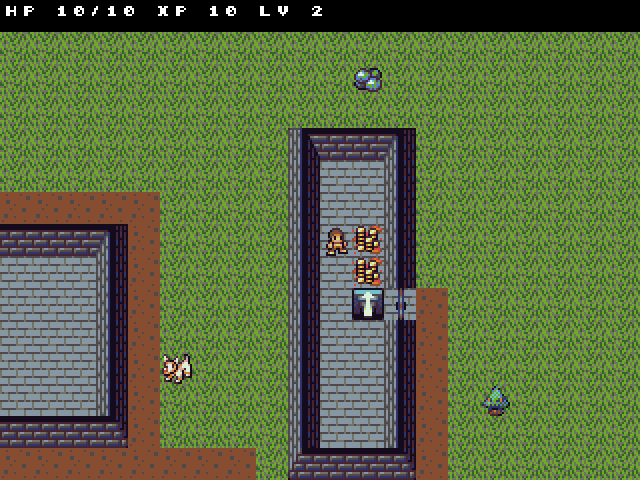 Here the player has been killed leaving his inventory behind. Is that the Dawnbringer 16 color palette? Yes it is. I do need to credit him for the palette DragonDePlatino used for his tileset. Added a simple menu interface for equipping and inventory. Just for fun added health and poison potions. Added throwing items to the mix. Potions may shatter on impact and apply their effects. Added simple elemental powers to the mix. Weapons/Units can have an elemental affinity; resulting in weakness, strong defense or absorbing damage. Also, some code to prettify simple tiles with all the borders, as shown with the grass/dirt in the GIF in the first post. Working on having different exits/region branches from a stage. This allows from the starting village (Haven) regular descents to other parts or a cave branch. Added poison as weapon effect. While a weapon with poison effect can poison the target it can also heal a poison absorber. This looks good. Do you expect it to stay fairly wide open or do you anticipate more narrow corridors and smaller rooms, etc.? good, but: mouse controls are not necessarily more accessible than keyboard controls and clicking through a million menus can be just as annoying/confusing as learning keyboard commands. just something to keep in mind. Fixed a few bugs and finally got round to add a new region type, Caves. Currently regions are still pretty simple, details like nice foliage will be added later on. Different regions carry different enemies; enemy tpyes also depend on the level of the region. Hurts the target on impact and if it explodes, adds some hefty fire damage on top. Currently the damage is not elemental yet, but will probably be. I really love these tiles. Added a few details to the menues. Now when equipping you get a display of before/after attributes. Also, freeze and fire potions which leave fire/freeze clouds behind hurting unlucky tresspassers. Are there any tiles you need? I'm in a pixelling mood and I just noticed the tileset is a little sparse in the way of items. I do plan to add lots more of foliage, this is just starting out. 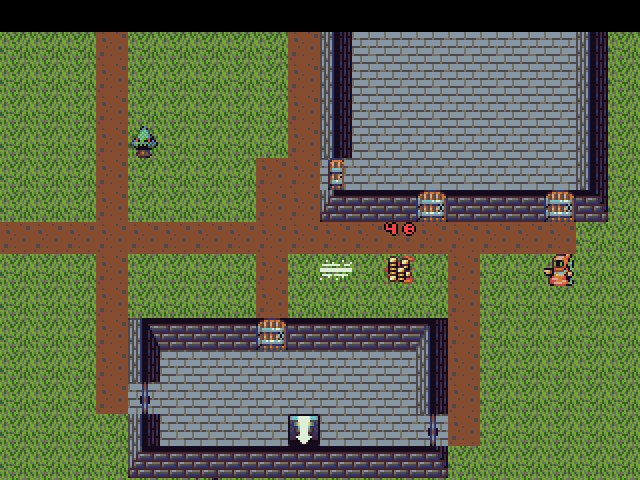 Regarding missing tiles, I "mis-"used the speech bubbles as status indicators, so I made two (just for now) bubbles with poison and blindness indicators. Items, hmm. Some more food items maybe? Added scrolls with spells. Spells can be targetted (depends on spell type; range depends on player stats) and hurt nicely. They do boil down to mostly the same effects as thrown potions. Rearranged some hastily written code and added states additionally to short time effects to units. Now you can get hit by a sleep potion and lose some turns.